If you have never heard of or used a TENS unit, TENS is an acronym for Transcutaneous Electrical Nerve Stimulation. The purpose of the TENS unit is to send a low-voltage electrical current to a specific body part, which is believed to help block pain signals from being sent to the brain, eliminating pain. I’ve tried a whole bunch of TENS units. Here are my reviews of the best ones I found. 1 What is The Best TENS Unit of 2019? What is The Best TENS Unit of 2019? Here is my list of TENS units that meet criteria of both value and features. The Play Maker by iReliev has features not only for pain relief, but EMS massage for muscle conditioning, recovery, and exercise prep. The combination of both TENS and EMS make this unit quite the versatile device. This device has a total of 14 programs, eight of which are for TENS and six for EMS. These programs have various functions. For example, P8 is designed specifically for managing arthritis pain. The Play Maker is easy to operate with only four buttons that put you in control. This unit is wireless and requires only one pad per channel. Therefore, one pad does the work of two. Wired systems tend to require two pads to do the job. You can set your treatment times for between 5 and 60 minutes as well as set the program intensity levels independently for each single channel, which means you can treat an area or two for longer if needed. 25 intensity levels give you total control over how strong you want your treatment. Most other TENS devices have only 20 or less. You may never need the full 25 levels but knowing there are so many levels from which to choose should instill confidence. Since you will likely need to replace your pads, iRelieve offers a subscription service for that to save you money. The device uses Bluetooth technology that requires no manual pairing to work with the pads as they are ready to use between the remote and pods automatically. Having no wires to worry with makes this TENS & EMS unit discreet and portable, so you can use it just about anywhere without anyone knowing. Once you have set this unit up for a program and timer, you won’t need to cycle through the programs every time you use it. It remembers where you were and goes back to that program. In other words, it will return to the timer and program you used last. It is compact and easy to carry with you in a hard-shell carrying case that has a spot for every piece and it protects the device from damage in case you drop it. This TENS & EMS device is ideally suited for portability, so you can relieve pain no matter where you go. The biggest complaints about the Play Maker is that its display screen is not as large as some of its competitors. However, it is easy to read and clear with the information well-spaced out. There is no problem related to reading the display, but some people prefer a larger screen. One of the purposes of this device is to be portable, therefore the small size. The Play Maker costs more than other units, but then its features offset the price. If you are on a budget, this Tech Care Massager TENS Unit is a more cost-effective device to buy, if you are getting one for the first time and do not want to put out a larger investment. If you are new to this technology this device is easy to use, intuitive, offers a large 3.75 inch display with backlighting, and offers 24 modes. It is loaded with features for the price. 24 modes are more than you will find on other TENS units in this price range (and some above), but this TENS unit has 24 stimulation modes. These modes include six categories of cupping, reflexology, and kneading massage. You can treat two areas of your body using this dual channel system. You can also choose from 20 intensity levels controlled by + and – buttons. 20 hours of use between charges is more than many TENS units provide. Unless you forget to charge your unit, it is not likely you will use up those hours. While the box it comes in is not a carrying case, it is a nice box that stores everything you need between sessions. One of the most appealing aspects of using TENS units is that it is a drug-free alternative that is effective against pain. TENS technology is FDA approved, as is the Spa-Buddy. The electromassage therapy from this device offers temporary relief from aches and pains that otherwise prevent you from enjoying a good quality of life. The one thing about the Spa-Buddy is that it is not the most modern or technically advanced TENS unit on the market. However, it is liked by new users and is easy to use for anyone who is not tech savvy or anyone who has never used this technology. It is touted as the nearly perfect entry-level device. There are no complicated controls on the Spa Buddy. Each channel has its own set of intensity controls, so you can adjust and let it do the work. Just press the plus or minus buttons up or down to increase or decrease the intensity as you need it. The simplicity of this design means less navigating through a list of complex controls to find what you want. There are 8 programs for the TENS with contrasting stimulation options and 30 intensity levels (one of the largest available). Therefore, you have ample control over how strong you want the current to be for a given area. Even though this TENS unit is small in size, its display screen is ample with the data spread out enough to be easy to read. The only issue with the display is that it has no backlighting. You can set the timer for between 5 and 95 minutes or choose the continuous setting. Regardless, the timer can be easily adjusted with one button. You will need 3 AAA batteries for this unit because it is not rechargeable. You will get about 10 hours from quality batteries. This machine is an excellent choice even with its few minor drawbacks. The benefits outweigh any drawbacks. When you are looking at spending less than $50.00 on a TENS unit, there are a few quality devices out there like the truMedic TENS Electronic Pulse Unit. This device comes with four electrode pads, two electrode lead wires, one USB wire, one A/C adapter, plus a couple of free bonuses to sweeten the deal. You will sacrifice screen size for the price, but when that is not an issue, this is an effective device for muscle aches, pains, stiffness, and soreness. The PL-009 unit requires 4 AAA batteries, which are included in the box. The benefits of the high-frequency pulses that this unit generates include stress reduction and pain relief. You get pre-set programs for massaging various muscle groups and you can adjust the intensity and speed. This unit is good for people who are not comfortable with modern devices. The buttons are easy to read and clearly marked, which means if you have problems reading small text or graphics, this unit offers a good solution. Be aware that the intensity dials are a bit easy to move, so be careful when using this device to avoid accidental intensity increases or decreases. However, this issue has not created a problem with customer satisfaction or sales since it is and has been a number one best seller on Amazon for a long time. The Omron is an easy to use system that has been used by medical professionals and physical therapists for over 30 years. The simple design and pre-set programs provide up to five levels of intensity, resulting in pain relief. This device is small, compact, and portable so you can take it wherever you go. It is small enough to fit in your pocket for discreet use. The pads are self-adhesive and reusable up to 150 times. This technology is approved by the FDA for home use. The three pad modes include lower back, leg/foot, and arm. You get to personalize your TENS therapy. You can expect variations of tingling, tapping, and massage-style sensations or muscle contractions known to decrease muscle spasms. It is wise to start with a 15-minute session to see how you respond. Once pain has stopped or decreased, it is time to stop the therapy. The Roscoe Medical TENS 7000 is a dual-channel unit with prescription-strength pain relief. 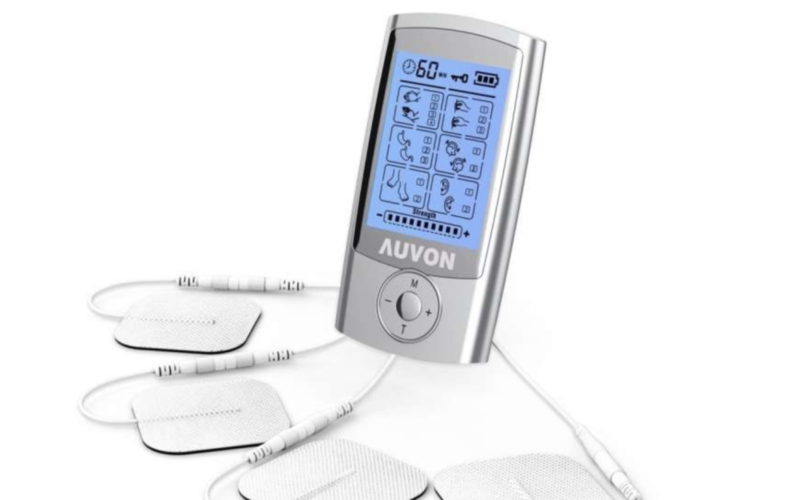 It provides targeted pain relief over independent dual channels that have control over four electrode pads. Pain relief from ailments like neck, leg, foot, shoulder, elbow, and knee pain, arthritis pain, and carpal tunnel. It has been used for these and other sports injuries and aches and pains by industry professionals as a drug-free pain management solution. Everything you need is in the carrying case. You get the TENS unit, four reusable electrode pads, a 9-volt battery, a pair of lead wires, a hard carry case, instruction manual, and a quick start guide. Therapy modes for the TENS 7000 include Normal, Burst, and Modulation Pulse Massager. You can control the strength-duration with number one or two. The AccuRelief TENS Unit promotes pain relief via its effective muscle stimulator that you control. There are four reusable self-adhesive electrode gel pads, the dual-channel TENS unit, one pair of lead wires, AAA batteries (not rechargeable), electrode placement guide, instruction manual, and a quick start guide. This easy-to-operate, portable device allows you to manage your pain levels instantly by blocking the pain signals to the brain. You can use six preset programs for specific body parts and tailor your TENS experience. You can easily adjust the intensity levels and your treatments with 25 levels of intensity. This unit provides a 30-minute shut-off feature to prevent overuse. Always check with your doctor or physical therapist before using this technology. This HM8ML model of the HeathmateForever TENS unit features one pair of long-life electrode pads, lead wire, four pads with single output, and programmable modes for a custom therapy session. This device is powered by a rechargeable lithium battery that allows you up to 10 hours of continuous use. Choose from 20 levels of intensity through this lightweight, compact, portable device that you can take anywhere with you and enjoy discreet use. Overall, there are more than 50 types of TENS units on Amazon and HealthmateForever claims theirs is the number one brand. This little gem of a TENS unit has a multitude of great features and is a higher end priced unit compared to other HealthmateForever devices. This Pro15AB model features totally isolated channels on a dual-channel system, which means it can be operated like two different machines simultaneously. This TENS unit is a small, handheld device that is small enough to be portable and discreet, but powerful enough to block pain signals from getting to your brain so you can experience some relief. Wireless technology is one of the key features of the HealthmateForever TENs & PMS Pro15AB. Not only does it block pain sensations, it also helps with muscle firming and toning. For instance, mode 10 is for the gluteal muscles and is ideal for bodybuilding. Back pain modes and combination modes are pre-programmed for ease of use. The adjustable timer provides you with 10-80 minutes of therapy via the T button. You can manage the intensity level from any one of 20 levels. The backlit screen is easy to read as you switch modes, timer, and levels of intensity. Several factors go into choosing the appropriate TENS unit for your needs. Here are some to consider. What do you need from the device besides pain relief. Some other factors may include rechargeable function, number of areas that can be treated at the same time, size of the display, and other factors will affect your decision. Set a budget and stick to it. Knowing how much you have to spend on this technology will help you narrow your search and save you time. Start with a short list of 5 TENS units and stay within that budget. Once you choose five systems, you can then narrow it down to between two and three. This is where you narrow the functionality you want from it. Things like the value for the cost, features, user ratings, and such should meet your criteria. Dig a little deeper into these devices to uncover anything that is a deal breaker to you. For instance, have you read about recurring problems with the machine that would prevent you from buying it? After taking all these factors under consideration, which device impresses you the most? Before making your final decision, consider going back to look at your initial list of features and expectations to see if the one you like matches your criteria. TENS units can be a safer alternative to traditional options for pain management. TENS units should never be used until you consult with a doctor or other medical professional with experience in pain management as even low-voltage electrical current can cause burns or skin irritations. They are not intended to be used by people with certain health conditions. This technology has been proven to be effective for relieving pain. Make sure the TENS machine you choose is FDA approved and that the product description absolutely gives you a detailed account of the device’s features, and because most devices are dual channel nowadays, make sure that’s an option. Other factors to consider include the battery (chargeable or not), ease of use, portability, accessories, extra pads or no, and an ample warranty. Consider your choice to be similar to that of choosing a new smartphone. The more features and higher quality options, the higher the price. It is more about what you can afford and what you want than how it looks or whether it is especially fancy or not. Price is less important as effectiveness and the value for the price. Make sure to stick to your budget but choose a TENS unit that is the best value for your investment. No matter what, select a device that provides you with the best drug-free alternative to pain management and pain relief. I’ve got chronic pain in my leg that I’ve been managing with pain medication but I’ve been thinking about trying out some alternative treatments. I’ve heard about electric stimulation therapy before but I don’t know as much about TENS in particular. Can I use it at home without medical assistance and supervision? But, as you have a medical condition it’s best you consult your physician first. That’s really interesting. I was wondering about the portable TENS devices. You say in the article that you can use those discreetly. Does that mean that I could, for example, go to my office and use one while working? Is it okay to do that or would it be better to relax and maybe lay down while receiving treatment? I haven’t tried it yet so I don’t really know what to expect. 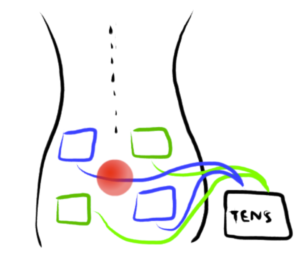 Are TENs units something you can administer or a family member can be the one to do the application or is it something that only my physical therapist can do? I actually find it useful when it’s used on me and it would be great to be able to use one at home.